Secretary Ankeney, of Chamber of Commerce, desires to warn its members, and the public generally, that it has come to his knowledge that solicitors are at work in Cumberland, getting donations and advertisements, and are conveying the impression that part, or all of the money contributed, is for the relief of the Western Maryland employees who are now on strike, and upon investigation the Secretary has satisfied himself that this statement, or inference, this not true. 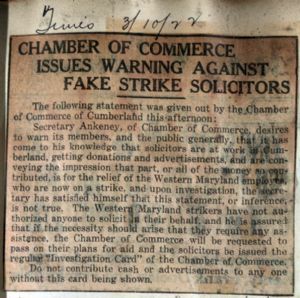 The Western Maryland strikers have not authorized anyone to solicit on their behalf and he is assured that if the necessity should arise that they require any assistance, the Chamber of Commerce will be requested to pass on their plans for aid and the solicitors be issued the regular "Investigation Card" of the Chamber of Commerce. Do not contribute cash or advertisements to any one without this card being shown.